Young people in Cork will be given greater opportunities to experience life at sea, thanks to new Government funding, said Foreign Affairs Minister and Cork South Central TD Simon Coveney. 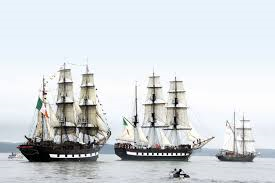 “Funding of €85,000 has been announced for Sail Training Ireland (STIRL), a charity that funds the development and education of young people by providing them with access to training programmes on board tall ships and other vessels. “The idea is to provide places to deserving trainees, particularly young people who are disadvantaged, people with disabilities and those who may not have had the opportunity to avail of such an experience due to their circumstances. The programme teaches several key skills such as self-confidence, leadership, team building, resilience, motivation and an understanding of diversity. “Overall, there were 341 trainees across the island of Ireland last year, 28 of which were in Cork. “This financial support by the Government will ensure that many other young people in Cork learn what it is like to go out at sea and all of the benefits that experience brings. “Many of the young people selected for these programmes have experienced significant difficulties and hardships in their lives. “Some are from disadvantaged backgrounds; others have learned to live with a disability. Sail Training Ireland does not own or operate a vessel. Instead it charters vessels as required.